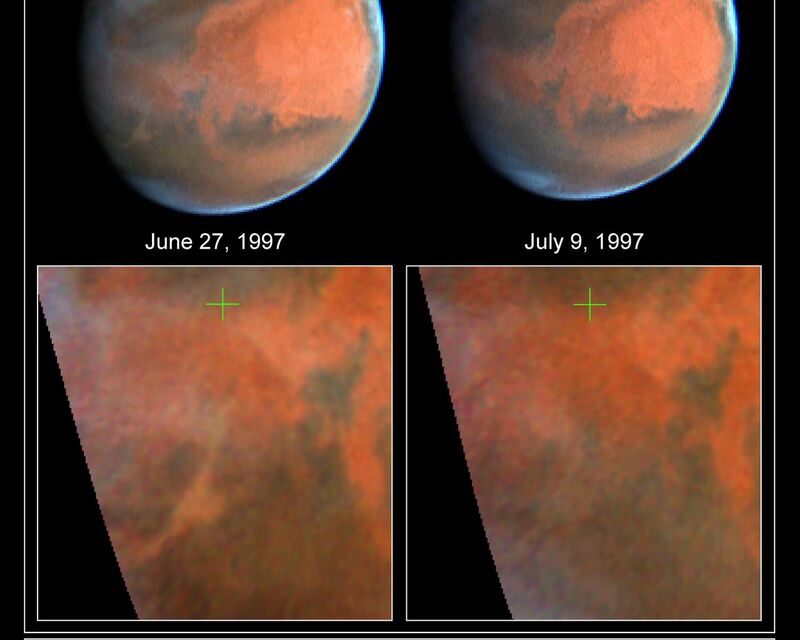 NASA's Hubble Space Telescope images of Mars, taken on June 27, 1997 (left) and July 9, 1997 (right), document the dissipation of a large dust storm during the 12 days separating the two observations. The images were taken to monitor the weather conditions near Ares Vallis, the site where NASA's Pathfinder spacecraft landed on July 4. Maps of the equatorial region were constructed from the images and are shown at the bottom of the figure; a green cross marks the Pathfinder landing site. (All images are oriented with North to the top). 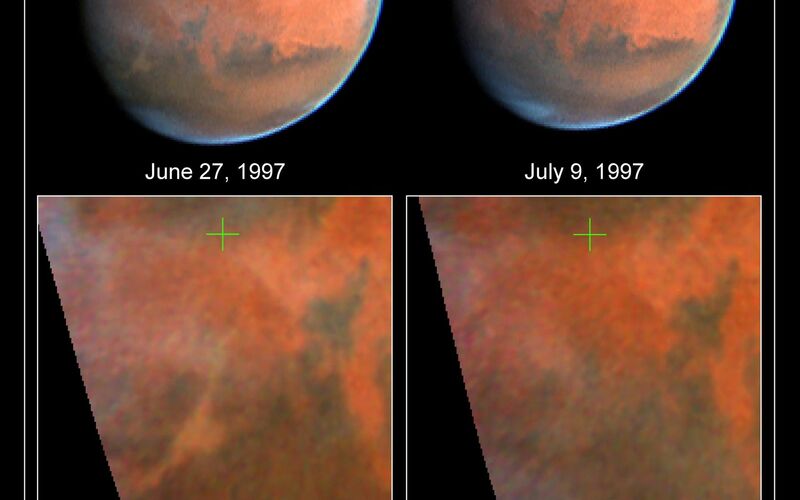 These two sets of observations show a number of dramatic changes in the planet's atmosphere. At about the 7 o'clock position on the June 27 image, the eastern end of the Valles Marineris canyon system is just coming into daylight and can be seen to be filled with yellowish dust. The dust appears to be confined to the canyons, which can be as much as 8 km deep and hundreds of km wide. Estimates of the quantity of dust involved in this storm indicate that 96% of the incoming sunlight is being blocked from reaching the surface by the dust clouds. 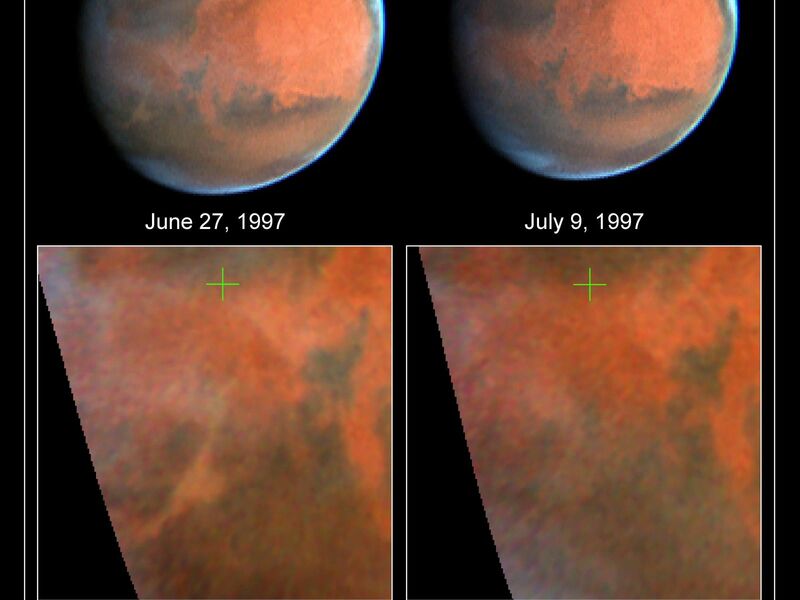 Note that on the July 9 image, the dust storm appears to be subsiding; it is estimated that the dust quantity in most of the visible canyon system has dropped to only 10% to 20% of that seen on June 27. However, on July 9 a streamer of dust is visible in the North polar region, extending about 1200 km southward from the dark sand dunes surrounding the polar ice cap; diffuse dust is visible over much of Acidalia, the dark region to the north of the Pathfinder landing site. The extent of clouds visible across the planet has also changed considerably between the two dates. Just to the west (left) of the July 9 dust streamer, a very bright area of water-ice clouds is seen; this area was considerably cloudier on June 27. These images dramatically show that atmospheric conditions can change rapidly on Mars. 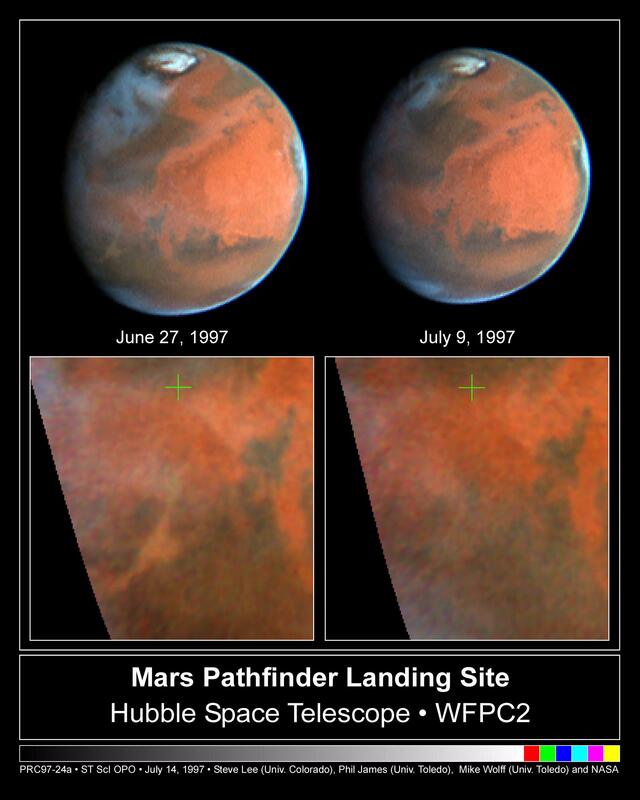 Observations such as these will continue to be made over the next several months, allowing the detailed surface observations made by Pathfinder to be placed into the broader context of the global images available from HST.